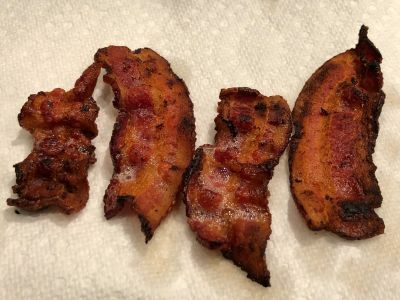 A lot of people gravitate to the microwave oven or the regular oven to do bacon because it is easier but in my experience it is never quite the same as when it is fried. If you've never fried bacon before I can see why this might be intimidating. But I assure you, after you have done it once or twice it will seem so simple. You know when you go to a restaurant and get a side order of bacon and hold up a slice and it just goes limp on you. It tastes ok and if you are eating it with something else I suppose it is serviceable. But it really should be better. That happens because they are cooking large quantities of bacon and most likely cooking it in the oven. Got it, you saved time. Congratulations. 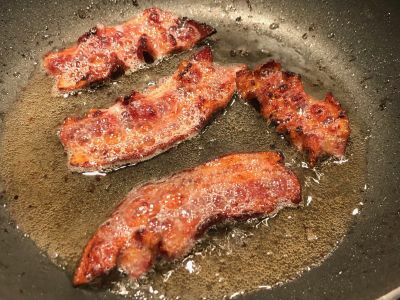 The key to crispy bacon is direct application of heat, ie frying. 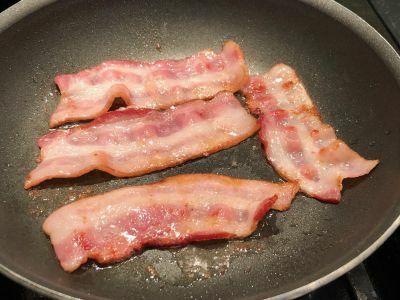 I like to start with a cold pan, put the bacon in, turn the heat to medium high and turn the bacon over several times as it cooks. 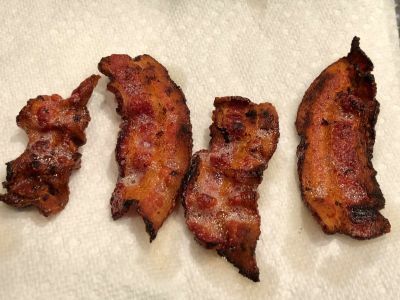 I also like to use tongs because if it starts to curl, you can use your tongs placed on both sides of the curl while applying pressure and it will bring the bacon back to flat. That means no greasy, fatty ends. The tongs are also safer in that your hand is further away from the spattering grease. When frying bacon, I use three types of pans interchangeably. Depending on whether I am just cooking bacon or using the same pan to cook something else afterwards. 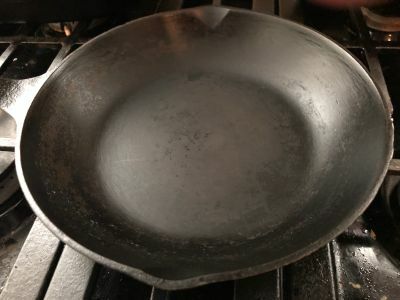 They are non-stick, carbon steel and cast iron. 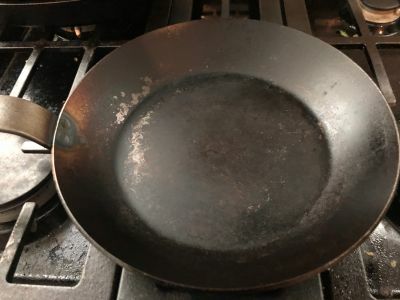 The non-stick is the easiest to use and the easiest to take care of because you can just throw it in the dishwasher (I never do) or wash it with warm sudsy water. Carbon steel and cast iron should never see soap. To clean them you run them under hot water and use a bristle brush to loosen any particles. This is how they become and stay seasoned which is what makes them non-stick. I don't normally use stainless steel for bacon because I find it can stick. But you certainly can use it and whatever pan you decide to use, you will get used to it over time so there is no right and wrong here, just preferences. So get started and fry up some bacon. And make sure to wear a shirt and whatever because sometimes it does spatter. And make sure you have some kind of vent hood or open window to deal with a little smoke that might arise. It will all be worth it, I promise. Enjoy! 1. 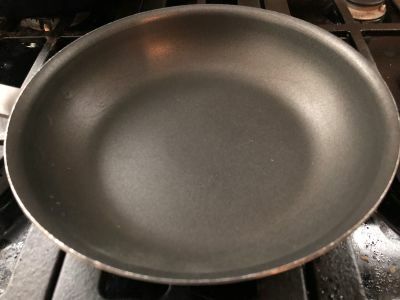 Place your chosen pan on the burner you are going to use. 2. 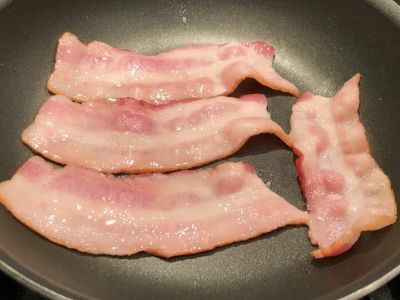 Lay the bacon slices neatly in the pan not overlapping each other. This is important so you can turn them easily when you are ready. 3. Turn the heat on to medium high. This will take some experimentation. Fortunately on my gas stove the correct temperature is at one of the natural stops in the handle. 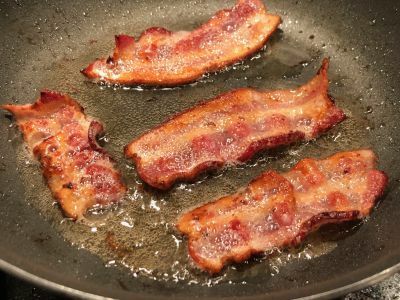 As the bacon cooks, turn it every 30 - 60 seconds and repeat this process until it is cooked. If it is turning black or smoking excessively (it might smoke a little but should not be bellowing smoke), the heat is too high. If it is not sizzling any more and it doesn't look done, the heat is not high enough. 4. When it is browned and not actively sizzling like it was then it is done. 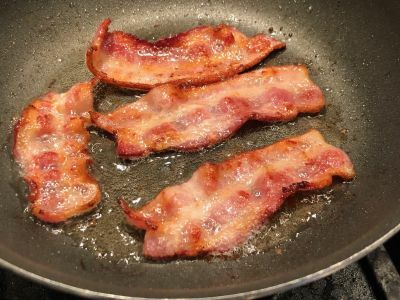 Remove the bacon from the pan and set it on paper towels to drain for several minutes before serving. Enjoy!